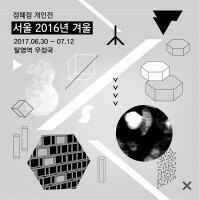 이 전시는 이라는 김승옥의 소설로부터 출발하여 1964년과 2016년, 50여 년의 사차 속에서 한 개인이 자신과 세계를 어떻게 바라보는지에 관한 것이다. 모두가 행복해지기를 원하지만 자신의 행복이나 명예, 이름을 버리고 익명적인 존재나, 기호화된 존재들이 되어가고, 소외되어가고, 격차는 더 심해지고 있으며, 예술에 대한 검열이 만연하고, 생존조차 위협받는 2016년의 겨울을 되짚어 본다. 이 전시는 의미 없는 수많은 '나'들에게 의미의 조명을 비춰 보는 일이었다. 촛불과 겨울, 백과 흑, 따뜻한과 차가움, 여름과 겨울, 개인과 사회의 대비되는 감각의 풍경을 입체적으로 구성된 구조물 위를 걸어 다니며 경험할 수 있는 설치와 영상, 드로잉으로 구성된 전시이다. 『Seoul 2016 Winter』 is based on a novel of KIM Seungwook, which dispassionately observes the phenomenon of human alienation. This work consists of a video, which send new light on the phenomenon at the point of year 2016 and an installation, which symbolically reconstructed Gwanghwamun rally and there appear three characters, which are borrowed from the novel. Mirror human, paper human and invisible human are three young people, who are not recognized as human. In fact, the artist wears clothes made by cans and walks through the rally spot. The three characters wanders around the spot and encounter one another. When a rally scene which has become out daily life and a fiction are combined, reality becomes more supernaturally exaggerated and fictitious characters experienced are reconstructed as a psycho-geographic map, which is a mix of space and time of novel in 1964 and memories in Gwanghwamum Square in 2016. While following the path, anonymous characters, a mountain built by candle drippings and cold eyes and hot cheeks are encountered. The exhibition hall is not a representation go experiences and memories. Rather, the hall induces the experiences of wanderers (audience).